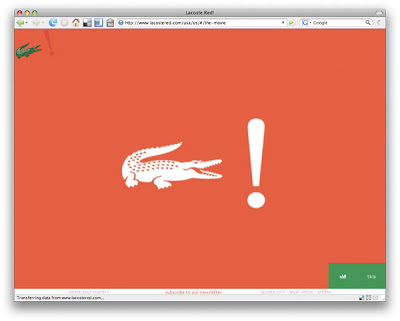 To finish out the Fashion Armor set I took a look at the newly launched Lacoste Red site. The site just recently won Site of the Month at theFwa, so I figured it be a shame to skip it. 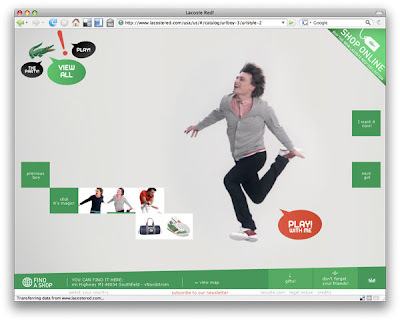 "Make the shopping experience vibrant and fun" had to be the strategy brief for this site. Or i'm a young guppy. Here you choose what style of person-jumping-in-air-pose you are. Many many years ago there as a really great Flash site called Homewrecker.com. It was that site and Gabocorp (if anyone remembers that one as well) that drove me to what I do now. Homewrecker was a clothing site as well and had these great interstitial scenes between sections of content with music clips that glued the experience together. I've included the image above because Lacoste Red has the same type of interstitials. Taking the time to design each part of the site, even the quick parts between content, can help strengthen your execution. After you click a style, the site really begins to shine in my opinion. The elegant simplicity might not show through enough in the image above, but they make the "jump" between browsing and shopping feel natural. A colored box for "I want it Now" reveals store locations in your area (drawn from your IP) and icons for sharing via email, blog, etc. Select accessories are given a small space, but you can't miss them. The layout has that "click-around" quality that only comes from careful design. And... Play with Me is a game. I would never have guessed!